After hanging out with the NSP Japan guys for a couple of days, which included some amazing food and ridiculously generous hospitality, the main part of the trip was a race in the small but beautiful town of Kumano, which sits on the Pacific Ocean side of the country just a few hours south of Osaka. 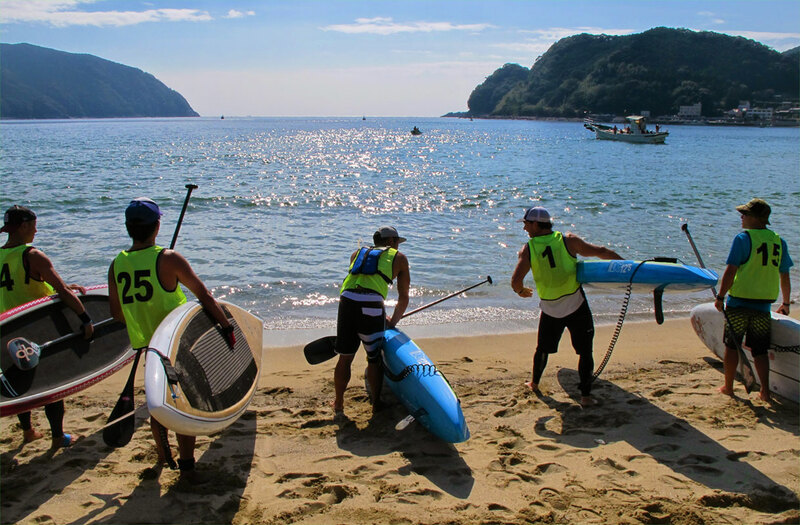 The race was called the “Kumano SUP Marathon” and from what I hear it’s the first race that’s ever been held around these parts. Thanks to some great organisation and promotion 171 paddlers lined up on the start, which is an awesome effort seeing it’s the first year. The local government is right behind this event and next year they wanna get hundreds of paddlers and an international-level prize purse. Can’t say enough good things about this event. Definitely keep it on your radar for 2015! Most stand up paddle racing in Japan is apparently flat, however the Kumano race was anything but. Once we headed outside of the protected bay and turned left we were greeted by huge World Heritage sea cliffs and plenty of bumps. The race itself was kinda gnarly actually – we had an onshore sea breeze that combined with the steep cliffs to create a tricky backwash for much of the race. I absolutely love any race in the bumps so I thought it was great, however I think it was a new experience for some of the local competitors. The water was a bit similar to that of Hawaii, kinda like paddling along the wall at the Portlock area (near the finish of Molokai-2-Oahu). Definitely not what I was expecting in Japan but I was pleasantly surprised and had a blast out on the course. It was an absolutely beautiful coastline. In the race briefing they actually encouraged us to stop during race and take it all in. Definitely the first time I’ve heard that from a race director!! I was happy to win the race but got a much bigger buzz out of seeing just how stoked the locals are. Everyone was smiling and happy no matter how fast or slow they were paddling. Kinda reminded me why this sport is so popular. No egos in the way. Nobody getting angry. Just a bunch of awesome people out on the water having a blast. Kenny Kaneko finished second and is definitely a name to watch in the future. He’s super quick. Kenny actually finished in front of me at the big Molokai-2-Oahu OC-1 race (one man outrigger canoe) earlier this year, so he definitely knows what’s doing with a paddle in his hands! There’s plenty of other up and coming talent over here and they’re all super eager to learn – I did a clinic with the NSP guys and everyone seemed to be stoked to get some tips from an international paddler. In a few years I’m sure we’ll talk about Japan the same way we talk about the strong paddling nations such as France and Brazil. Can’t wait to come back to this place. I’d always heard that people in Japan were nice but this was something else. Everyone I met went out of their way to make me feel welcome and for some reason they were treating me like a rockstar… Felt like Michael Jordan for 72 hours: Tall and famous all in one haha. Thanks everyone for an awesome trip!